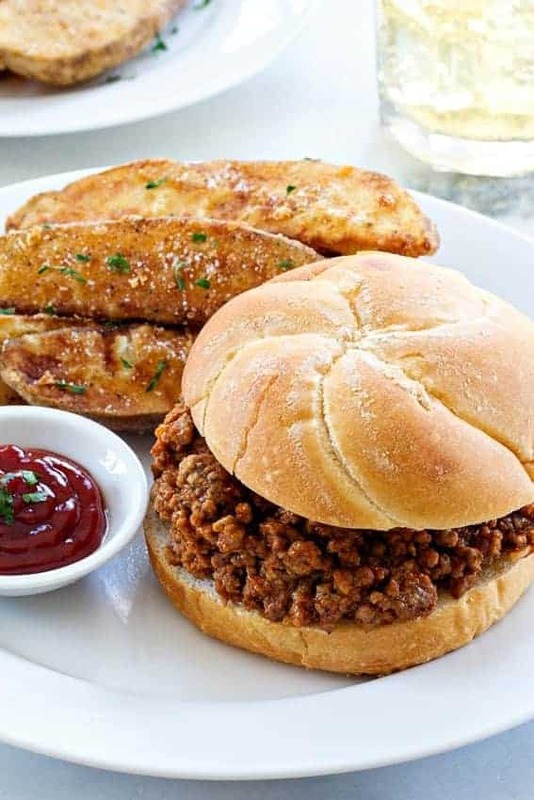 Homemade Sloppy Joes are super satisfying and come together with minimal effort. They’re sure to become a family favorite! I sat down in early January and came up with a list of goals for My Baking Addiction for 2016. One of those goals happened to be sharing things other than desserts. Whether it be home decor topics, products I’m loving, or delicious dinner recipes, I decided that I’m going to share a little bit more of the things I love. Now before we all get our knickers in a twist, know that the primary focus of my blog will continue to be desserts. That’s never going to change. I’m simply expanding just a bit to keep the creativity flowing and also appeal to be both long-time readers and new ones. Plus, if I’m completely honest with you, I need some motivation to help get my dinner game a little stronger. As I’ve mentioned before, Eric and I both work from home, which to many of my friends is their worst nightmare. I often get the “You mean you’re together 24 hours a day, 7 days a week?” stare that awaits a series of verbal gripes, but truth is, it’s not bad at all. We both have our own work spaces and are able to balance our schedules pretty easily. But despite both of us being home all day, every day, our meal planning game is most definitely not on point. Unless we’ve got something bubbling away in the slow cooker or ready for the Instant Pot, one of us is either scanning the pantry, or running to the market around 5:00. It’s just the way we roll around here. But both of us are kind of fed up about it, so we’re dedicated to making a change. Call it a new year resolution, if you will, but I’m hoping with you folks keeping us honest, we’ll call it a lifestyle change before long. 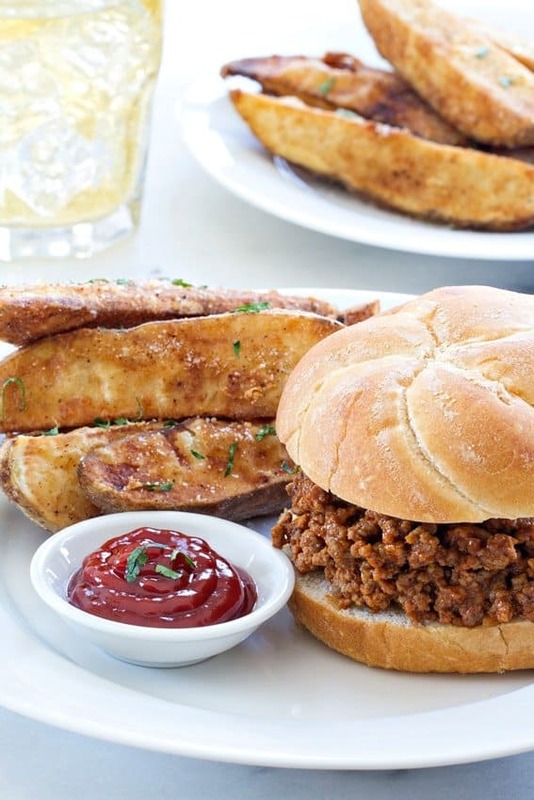 One of our favorite on-the-fly meals happens to be these simple Homemade Sloppy Joes. They come together super quickly, require minimal ingredients, and they pair perfectly with just about anything from a fresh green salad to Jo Jo Potato Wedges or chips and French onion chip dip. Sometimes we serve them on buns, sometimes on leftover biscuits – even a slice of toasted bread works in a pinch! What do you say? You with us on this whole dinnertime game change? I am thinking weeknight dinner favorites like this easy meatloaf recipe or this goulash. I’m hoping you could use the motivation too, and we can do this together. 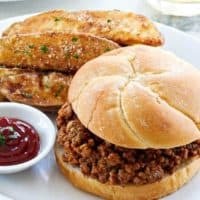 I’d love to hear your favorite quick and easy meals too! Add whisked ingredients to the browned beef and stir until thoroughly combined. Bring mixture to a simmer. Reduce heat to low and continue cooking for about 15 minutes, stirring occasionally. This recipe doubles well to feed a crowd. 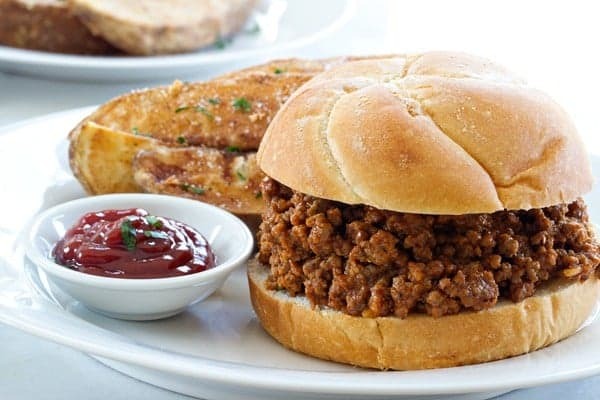 Homemade Sloppy Joes freeze well in a freezer-safe container. I hope you love them, Laura! Thanks so much for stopping by! This is similar to my “recipe”. I add diced green peppers to mine. I also use fresh garlic cloves and finely chop them instead of garlic powder. Never thought to put mustard in it! Might have to add that next time. I’ve used fresh garlic as well, but never green peppers, I’ll have to give that a try! Thanks so much for stopping by! Delish! Thanks for the recipe, I liked how it didn’t have a ton of ingredients but was yummy. I did add a dash of Worchestshire which was great, but not necessary. I also didn’t remember to get the bell pepper so I used 3/4 c of steamed spinach. Couldn’t taste it, but added some nutritional value. Great ideas, Laura! I’m so glad you liked it!